The condensate or product, if of acceptable quality, is delivered to the appropriate tanks by the distilled water pump. Quality is continuously tested by the salinometer both at start up and during operation. If the device registers an excess of salinity it will dump the product and activate the alarm using its solenoid valves. The product is recirculated in some installations. Pure distilled water may be considered a non-conductor of electricity. The addition of impurities such as salts in solution increases the conductivity of the water, and this can be measured. Since the conductivity of the water is, for low concentrations, related to the impurity content, a conductivity meter can be used to monitor the salinity of the water. The instrument can be calibrated in units of conductivity (micromhos) or directly in salinity units (older instruments in grains/gall, newer instruments in pprn or mg/litre) and it is on this basis that electric salinometers (Figure 1) operate. 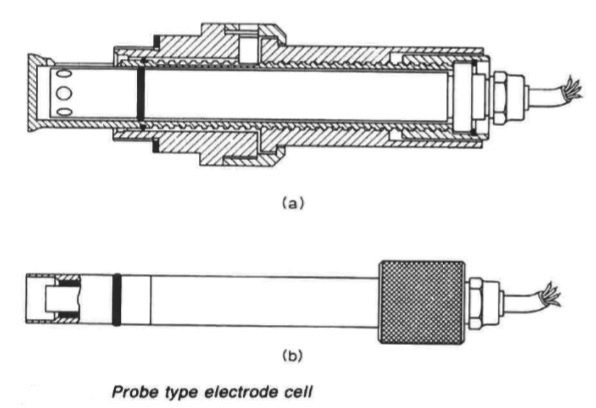 The probe type electrode cell (Figure 2) is fitted into the pipeline from the evaporator, co-axially through a retractable valve which permits it to be withdrawn for examination and cleaning. The cell cannot be removed while the valve is open and consists of two stainless steel concentric electrodes having a temperature compensator located within the hollow inner electrode. It operates within the limits of water pressure up to 10.5 bar and water temperatures between 15 and 110 deg C. The incoming a.c. mains from control switch S2 through fuses FS, feed transformer T. A pilot lamp SLl on the 24 V secondary winding indicates the circuit is live. The indicating circuit comprises an applied voltage across the electrode cell and the indicator. The indicator shows the salinity by measuring the current which at a preset value actuates the alarm circuit warning relay. The transformer cell tapped voltage is applied across a series circuit comprising the bridge rectifier Mrec, the current limiting resistor Rl and the electrode cell. 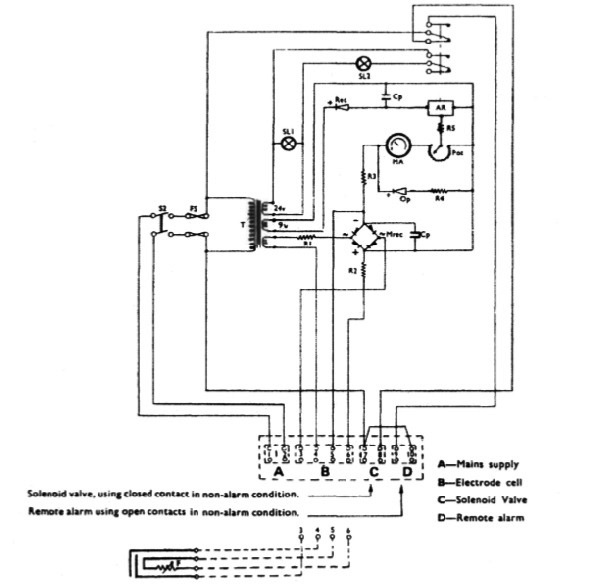 The current from rectifier Mrec divides into two paths, one through the temperature compensator F via resistor R2 and the other through the alarm relay potentiometer (Pot) indicator MA and resistor R3, the two paths joining in a common return to the low potential side of the rectifier. The indicator is protected from overload by a semi-conductor in shunt across the indicator and potentiometer. When the water temperature is at the lower limit of the compensated range the total resistance of the compensator is in circuit and the two paths are as described above. As the temperature of the water rises, the resistance of the compensator device drops progressively, the electrical path through the compensator now has a lower resistance than the other and a large proportion of the cell current. The compensator therefore ensures that the alteration in the balance of the resistances of the two paths corresponds to the increased water conductivity due to the rise in temperature and a correct reading is thus obtained over the compensated range. The alarm setting is adjustable and the contacts of the warning relay close to light a lamp or sound a horn when salinity exceeds the acceptable level. The salinometer is also arranged to control a solenoid operated valve which dumps unacceptable feed water to the bilge or recirculates. The salinometer and valve reset automatically when the alarm condition clears.